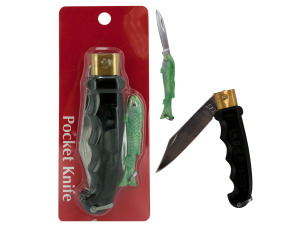 Gift set includes 1 small knife with fish design handle and 1 medium knife with a dragon design handle. Both knives have metal blades with plastic handles. Blades are 2 3/4" and 4" when closed. They are 4" and 7 1/2".